August 2017 - my name is Food. 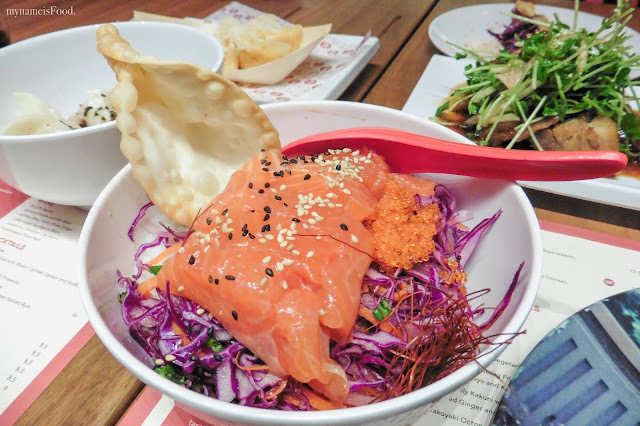 Located in the Albert Street Lane, Harajuku boasts Izakaya style Japanese dishes with an environment that is loud, bright and colourful filled with robot toys that just may be robocop hung from its ceiling. 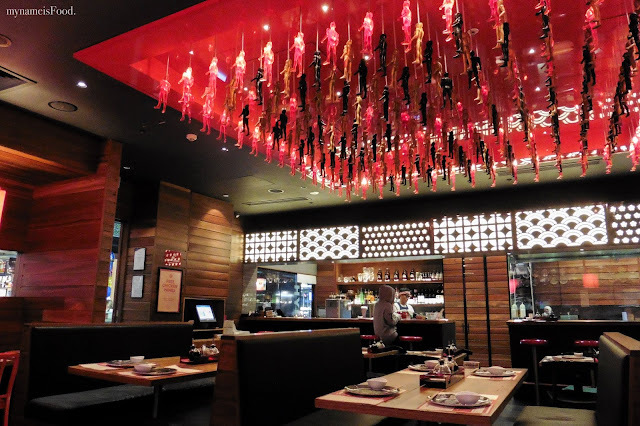 When someone orders their sake shots, you will hear the cowbell ring and cheering coming from nearby. Their prices for a dumpling plate isn't cheap, but many still dines here for the environment and ambience as well as to try something new that maybe, they haven't before. Offering quite a wide variety of drink list including Japanese craft beers, I could not say no to craft beers. 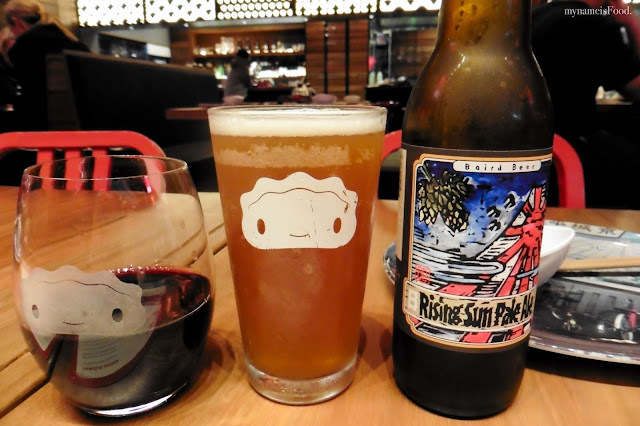 We opted for the following drinks to start off, 'Longview Shiraz Cabernet Sauvignon' and 'Rising Sun Pale Ale'. 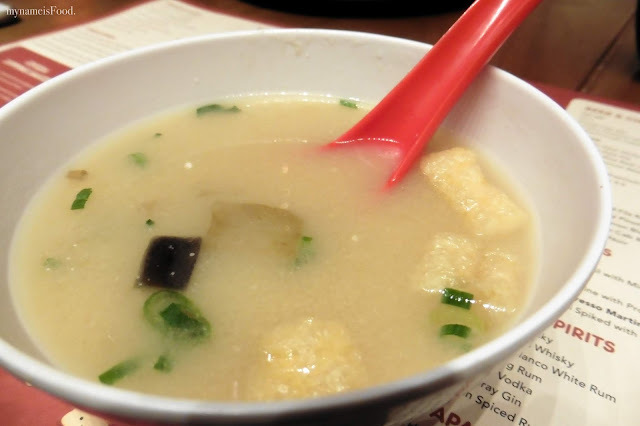 'Miso Soup' was not anything special with the usual tofu, crisps, spring oninos and seaweed. I did however find it more powdery than usual. 'Tofu Open Gyoza' was accompanied by red cabbage, edamame, shiso cress with a soy and spring onion dressing. 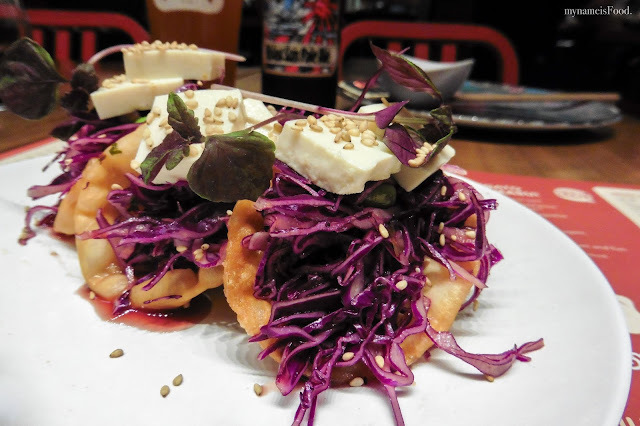 We loved the concept having a deep fried wonton skin holding everything in just like a taco. 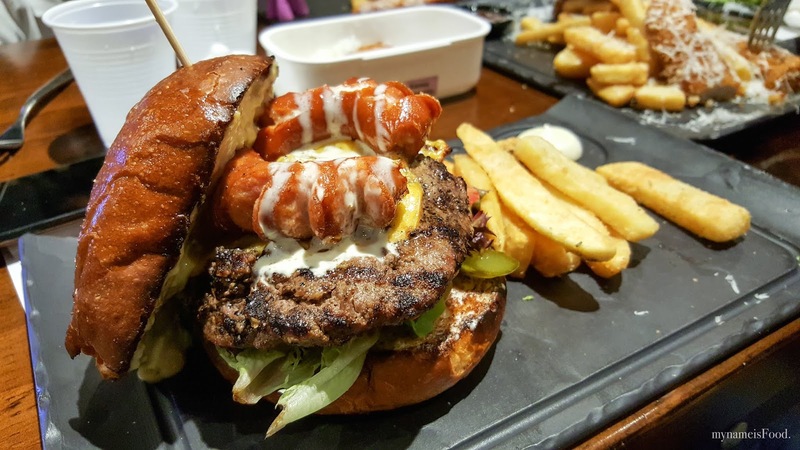 However, trying to bite this without dropping a tofu or edamame or red cabbage, was simply impossible. The soy and spring onion dressing gave it a nice touch with the edamame in it too which I quite enjoyed. 'Three Cheese Gyoza' was something that caught our eye as we thought it was an interesting combination to have in a crispy deep fried dumpling skin. Sadly, it was rather disappointing. The three cheese weren't noted out what kind of cheese and after biting into it, it was rather dry and seemed as if it was only one kind of cheese. 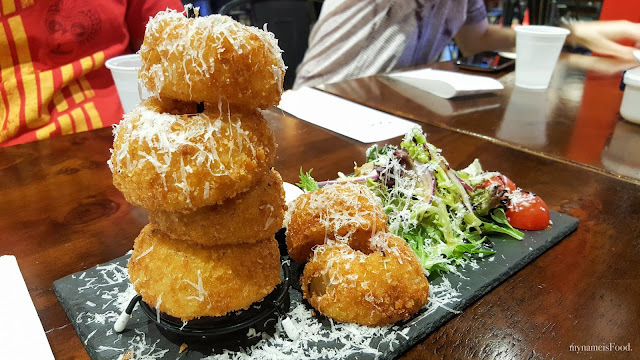 We weren't too sure of what kind of cheese we were suppose to be trying to taste. A bit oily too, I might add in the skin's texture. 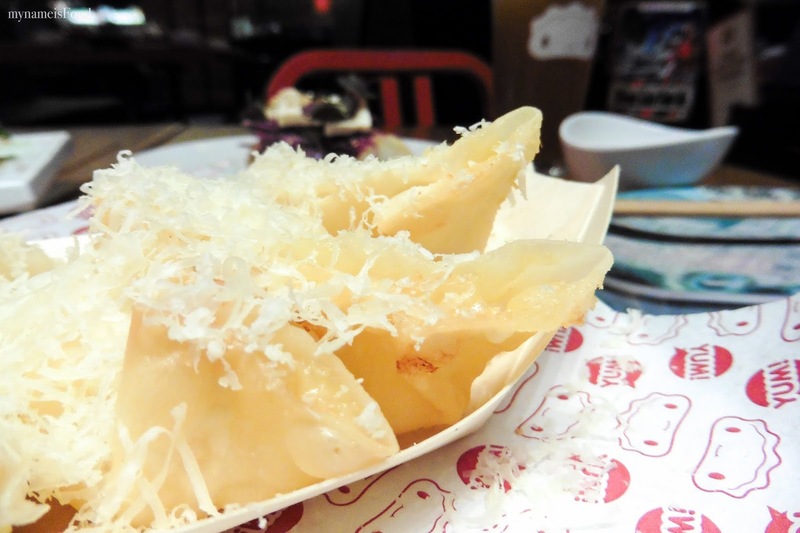 Having the slightly grated cheese on top of it all, didn't help as much as everytime you would take one gyoza with your chopsticks, the cheese would just fall to the plate. 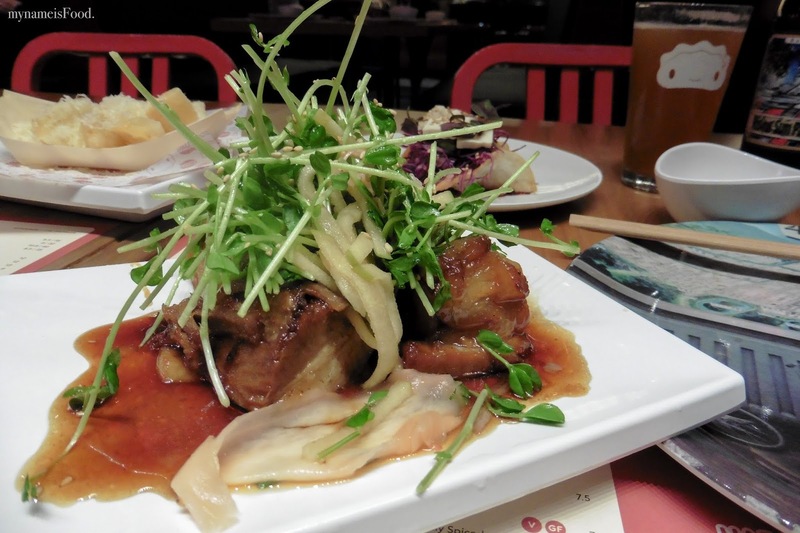 One of their side dishes that stood out was their 'Slow Cooked Pork Belly Kakuni' served with shiso cress and ginger. 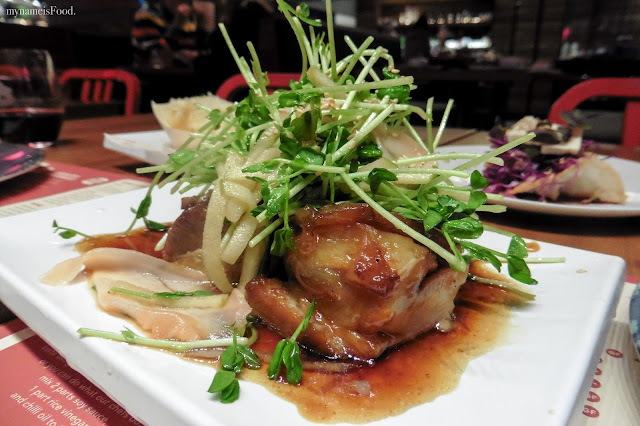 A warm dish to start off the night but I did feel that there was a thick of pork fat on top which not many people may enjoy but there are some who will love it. The soy based sauce was quite sweet and since the pork was already drenched in it, overall, was a very sweet pork belly dish. If the pork fat was thinner per say, I think I would've enjoyed this more as it got a bit sickening after 2 pieces. Another gyoza ordered was the 'Pork and Prawn Gyoza' of which we chose poached instead of grilled to give us a bit of variety. 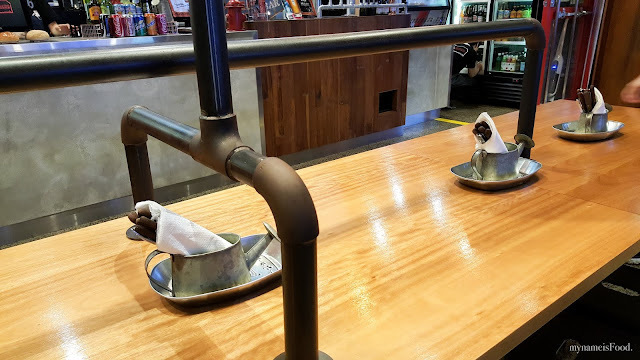 The sauce was already drizzled on top of it which allows you to just dip more on after each bite into the sauce again. 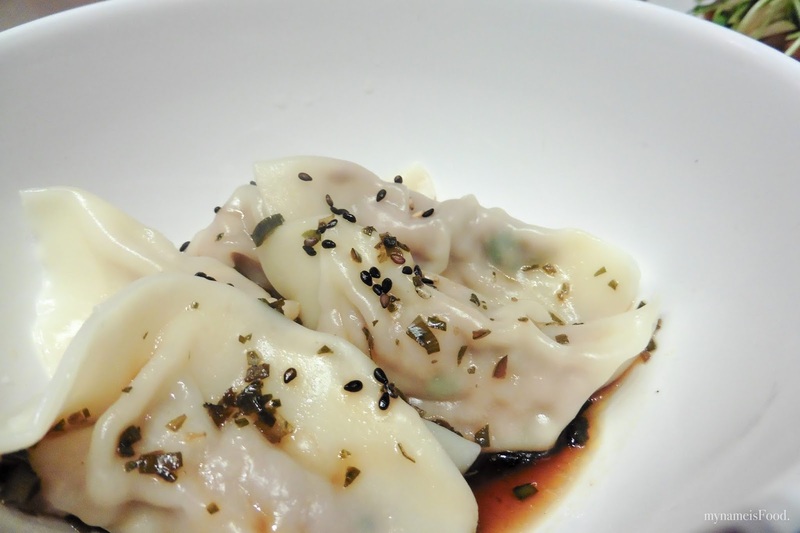 The filling of the gyoza was juicy and quite filling which was good. 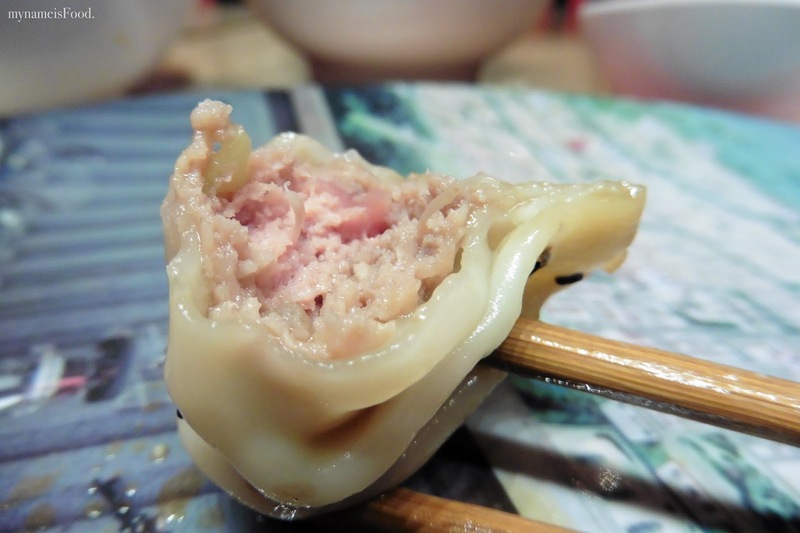 The gyoza skin was not too thick nor too thin was was good, does not make you needing to chew for too long until you are able to swallow it. 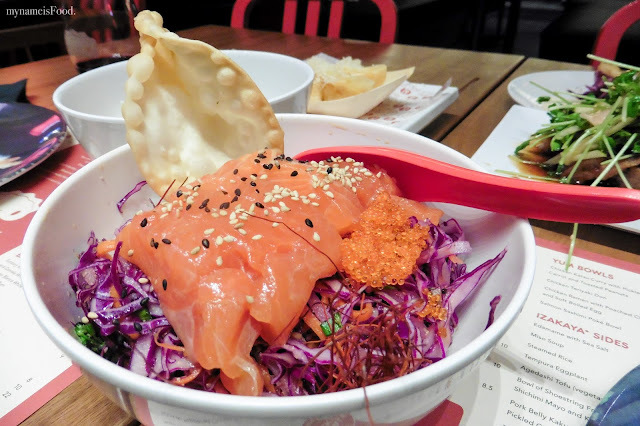 'Salmon Sashimi Poke Bowl' was one of their dishes I have seen on social media but have not yet visited here again to give it a try. The amount of salmon sashimi I think was actually not too bad however, the raw fresh red cabbage salad needed a slight sauce on it as it was dry overall. 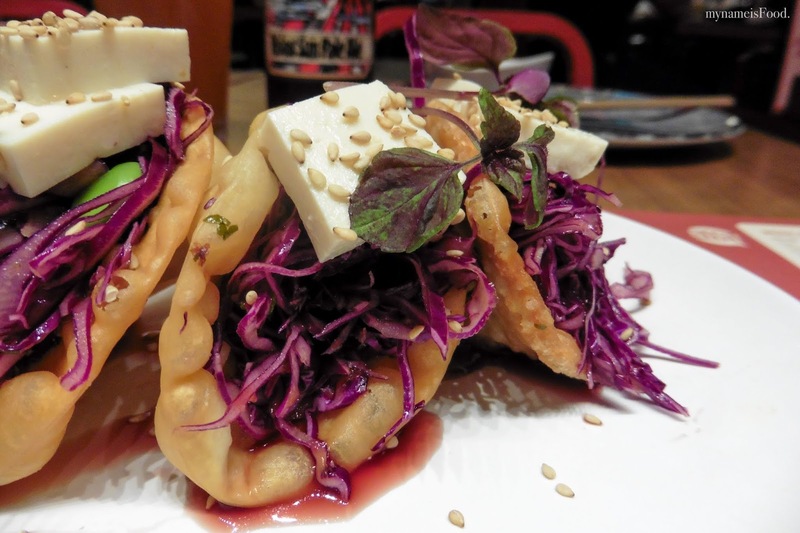 Having the crispy wonton skin was a nice touch placed on top. As well as having that dollop of caviar and both black and white sesame seeds. We actually had to end up getting some of the leftover gyoza sauce or the pork belly's sauce and drizzling into this bowl before mixing it all together. 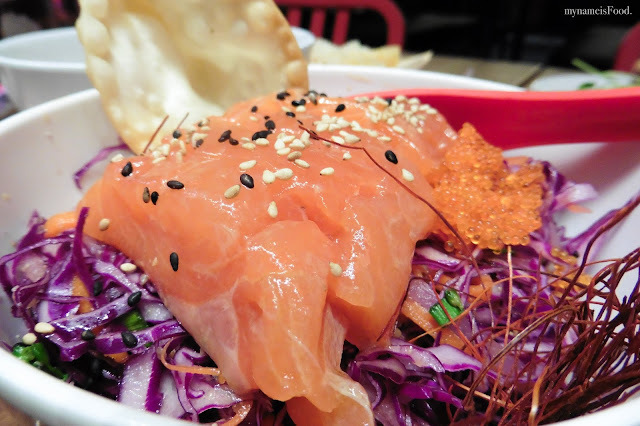 The salmon sashimi slices tasted fresh but although it may look like quite a lot in the beginning, after mixing it altogether with the rice below it, you do feel that you were eating more of rice and red cabbage salad and leaving the salmon alone as there wasn't enough to go along with the rice and red cabbage. Now, time for the desserts. When these cute fluffy Japanese pancakes came to town, it was definitely everywhere in social media. 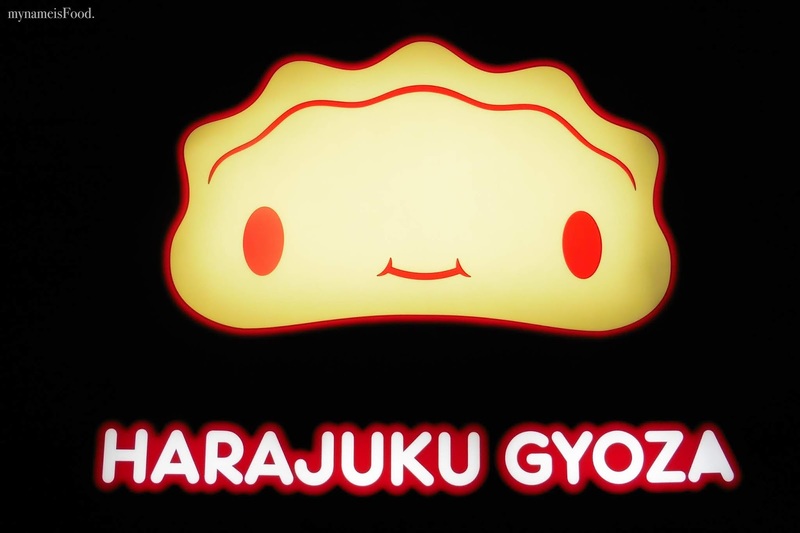 With Harajuku Gyoza adding in their raindrop cake in the same year, it's nice to see how there is a restaurant keeping up with all these insta-worthy dishes and bringing it from either Asia or the US and making their own. Allows for a wide variety of diners to be able to experience it too, in their hometown. 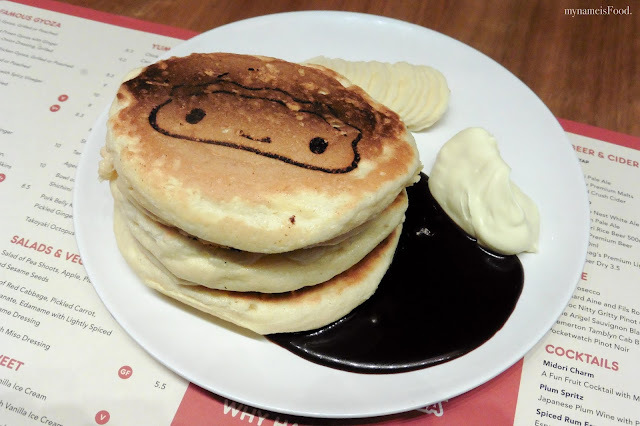 These pancakes were inspired by the famous pancake cafe in Tokyo called Cafe Gram. 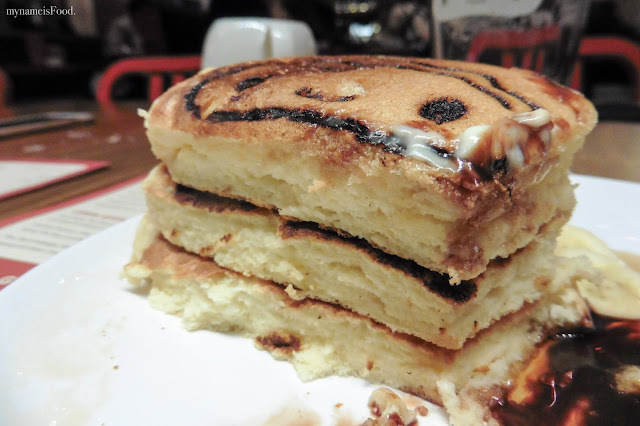 The 'Japanese Souffle Pancakes' came with a stack of three giant fluffy pancakes of which is roughly about 5cm high, which is thicker than your usual pancake - Everyone can agree on that. What makes them fluffy and tall is their meringue mixture which has noted to be slow-cooked for 12 hours before being served. 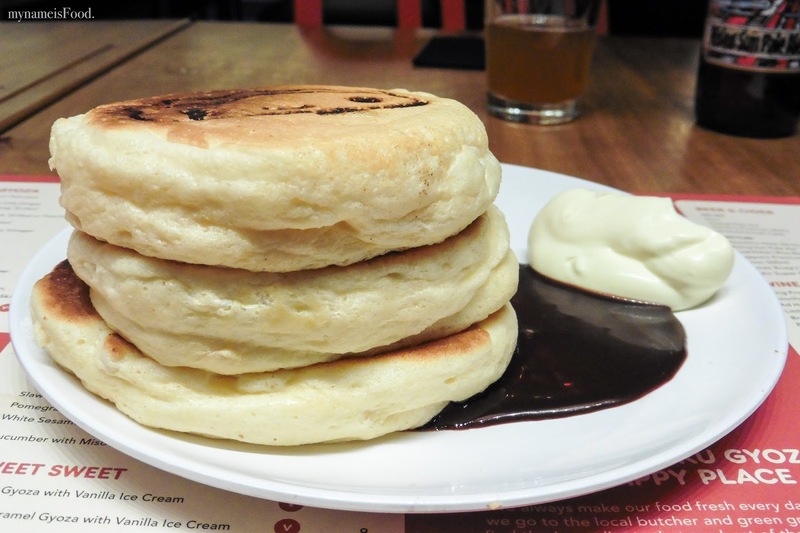 These pancakes come with a dollop of cream, fresh thinly sliced banana, chocolate sauce with a splash of maple syrup. Yes, sweet on top of sweet and add on another layer of sweetness. If I was to finish this whole dish by myself, maybe I'll only be able to get through half of it. Though I can say that it definitely is comfort food. 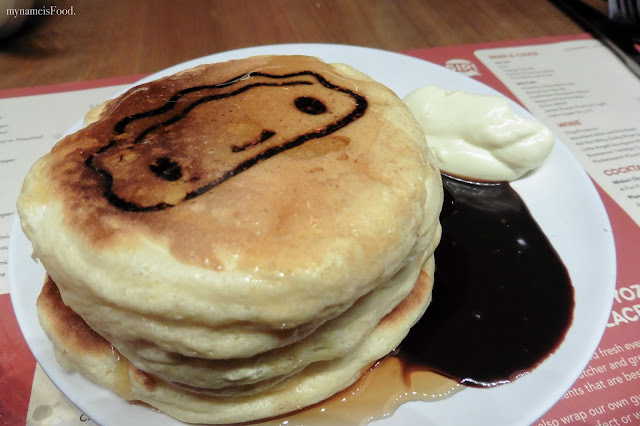 Imagining a midnight snack and what you wanted was a plate of fluffy pancakes with one hand holding a milkshake. Okay, maybe going too far, but seriously, you could maybe imagine that too, right? 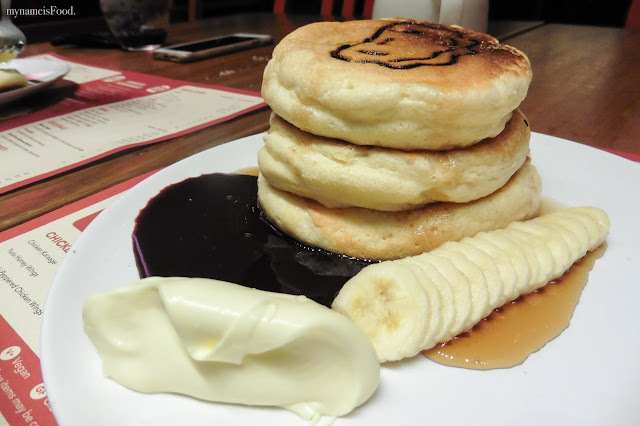 The souffle pancakes were quite heavy in texture and whilst eating it along with the syrup or chocolate sauce and cream, and add in the banana, it's basically a full meal but for its price, I think it was quite reasonable as what you do get is a big portion. 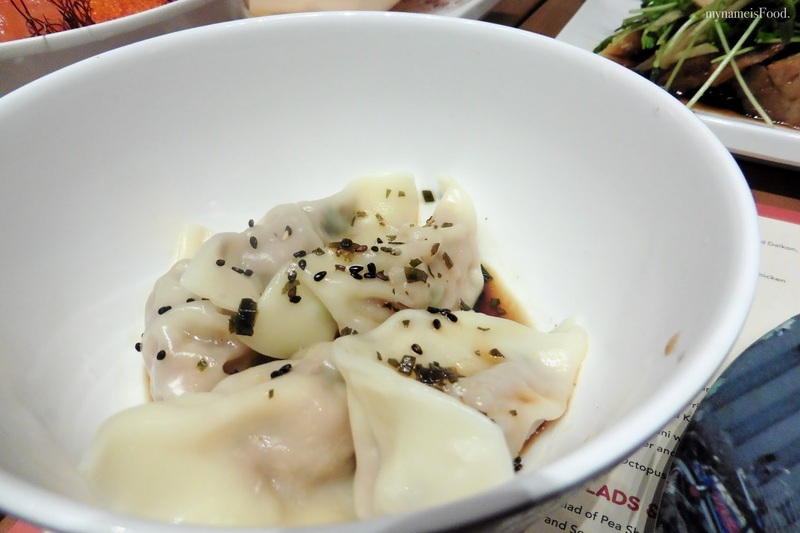 Yes, I would come back again for this, but not for the gyozas. 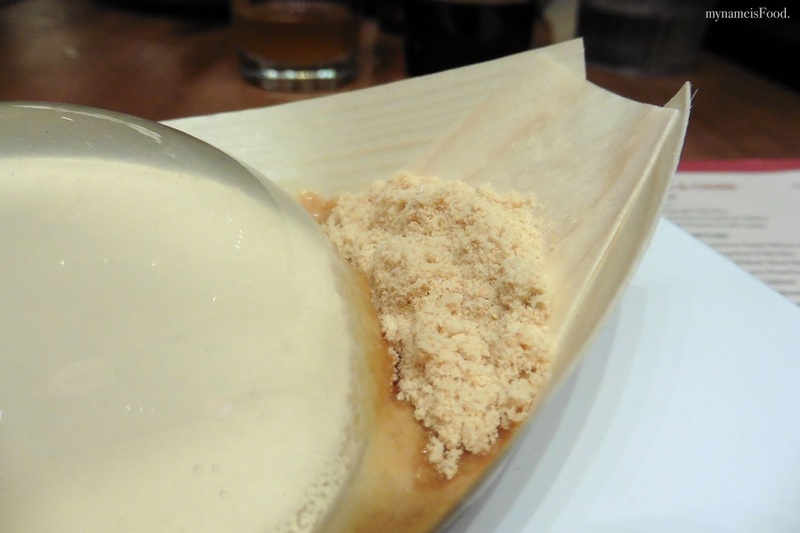 'Raindrop cake' served on a small bamboo boat with caramelised sugar syrup and roasted soy flour (kinako) mixed with sesame powder. 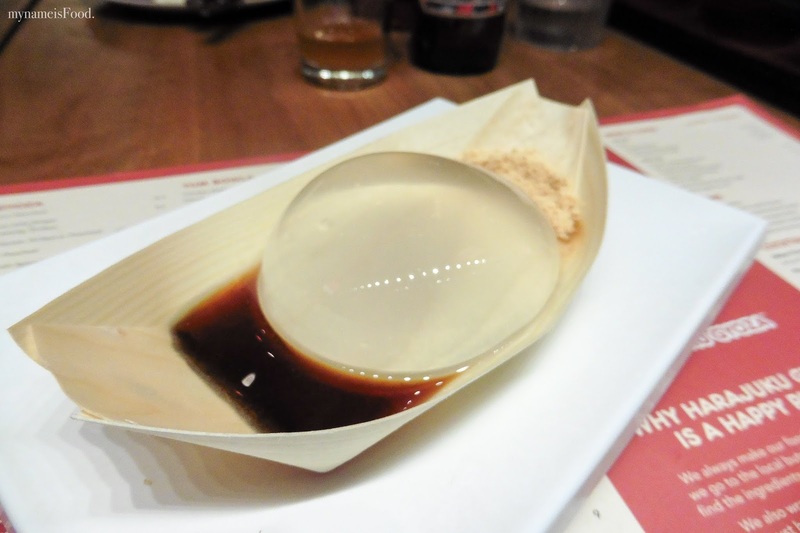 Although the raindrop cake now may have different flavours, we thought we'd opt for the original. The cake was more like a pudding and jelly combined into one. It's basically a jiggly, watery sugar and agar agar. I've eaten agar agar in desserts often before and I did feel that this was quite bland and tasteless. However, if you added the syrup or the kinako, then yes, you do have that slight sweetness flavour. 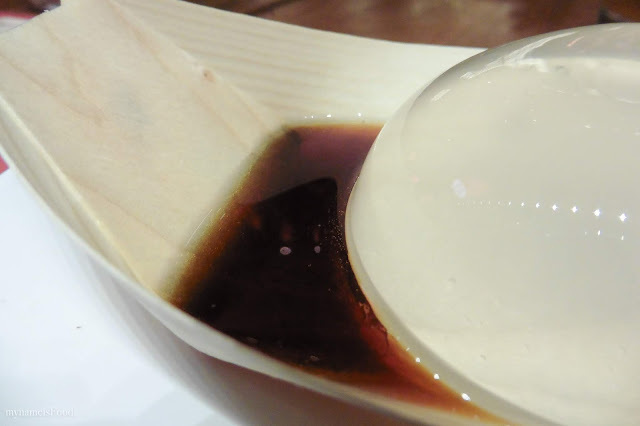 It's quite pricey for what you get but then, the raindrop cake is quite a big dollop. 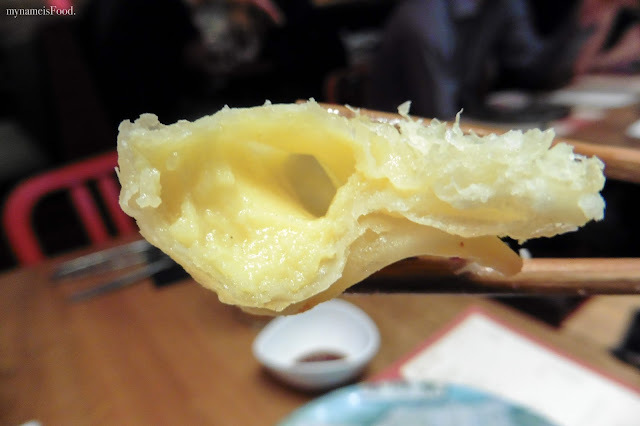 You will somewhat find that when you try and spoon it along with the kinako or the syrup, you may end up having more jelly than the accompaniment. A refreshing dish that will make you wake up but it does melt so you would need to eat it rather quickly before it goes away leaving you with a bamboo boat filled with watery dessert. It does definitely look pretty, a raindrop which reminds you of the actual rain drop in the animated film, A Bug's Life. 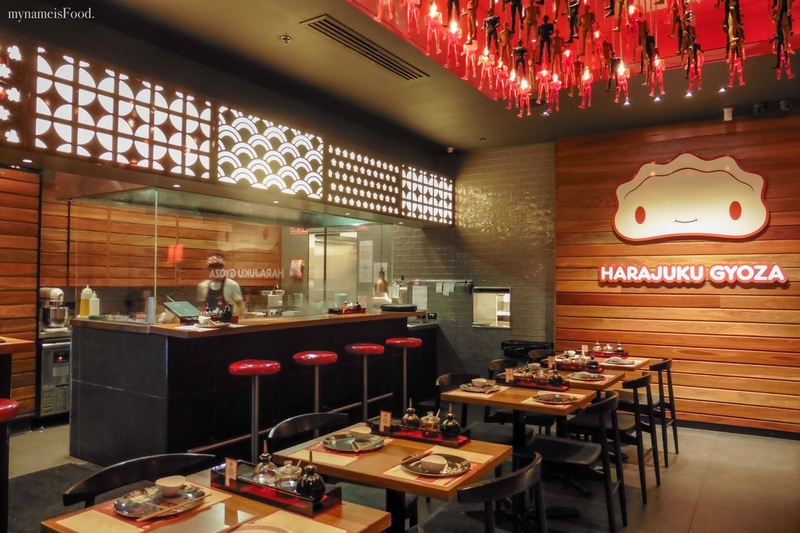 Since Harajuku Gyoza is the only place in Australia currently serving up these two dishes, if you're curious and interested and would like to know what the hype is about, then you may need to just come down and give it a try for yourself. 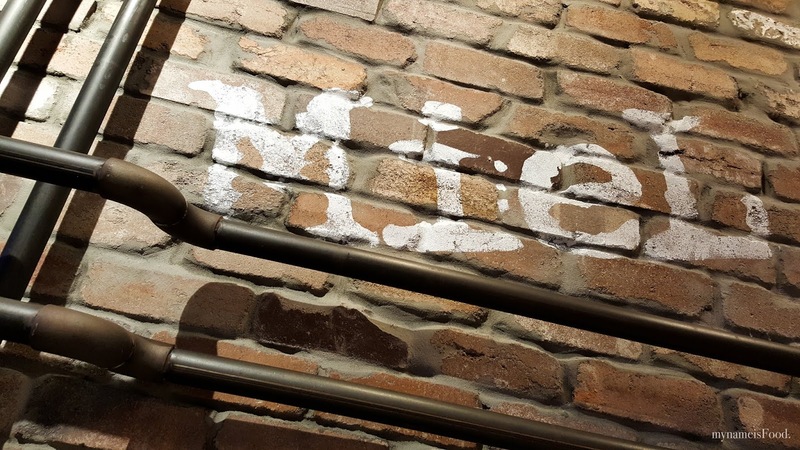 *mynameisFood. 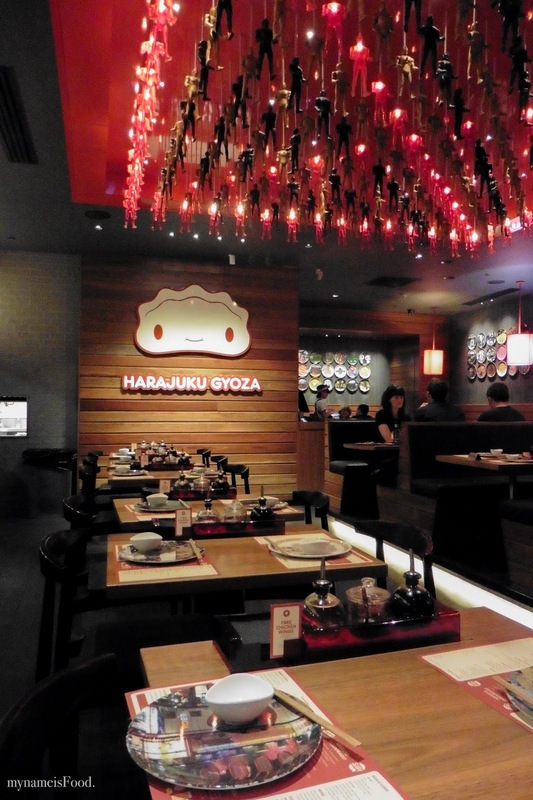 was invited as a guest to dine at Harajuku Gyoza, however as always, all opinions are of our own. 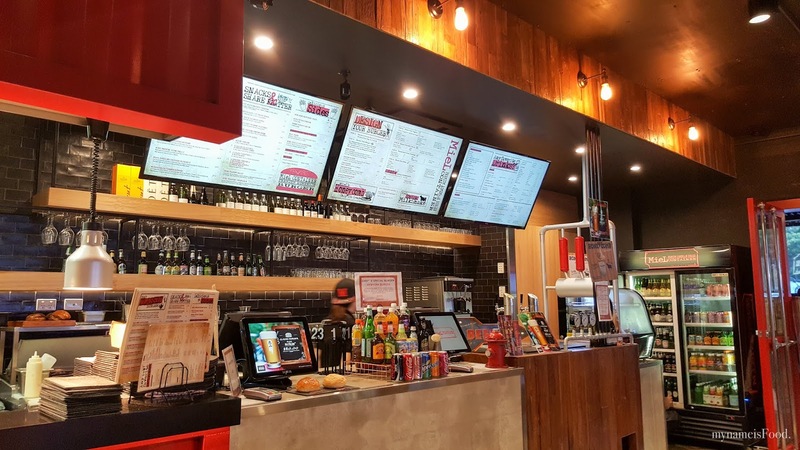 Was rather surprised when this opened in Market Square but also glad as we probably needed something non-asian from time to time. However, I'm unsure how they will handle the competition with all the neighbouring asian restaurants surrounding them. 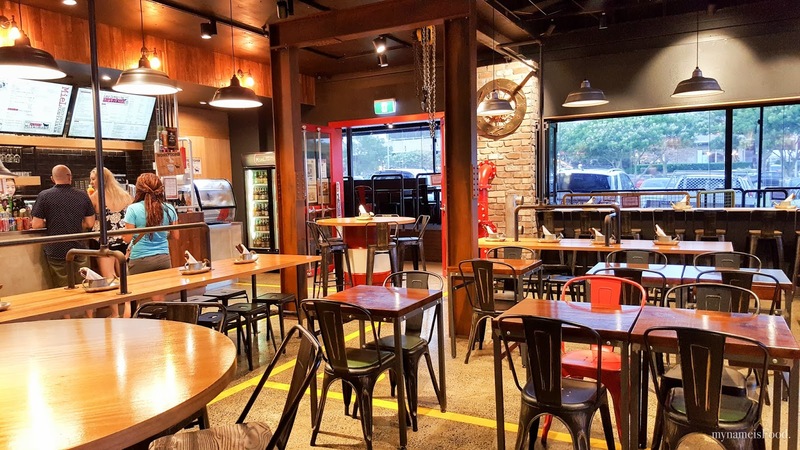 I've initially tried their branch in the CBD and enjoyed their burgers so hoping that this would be also a good experience. 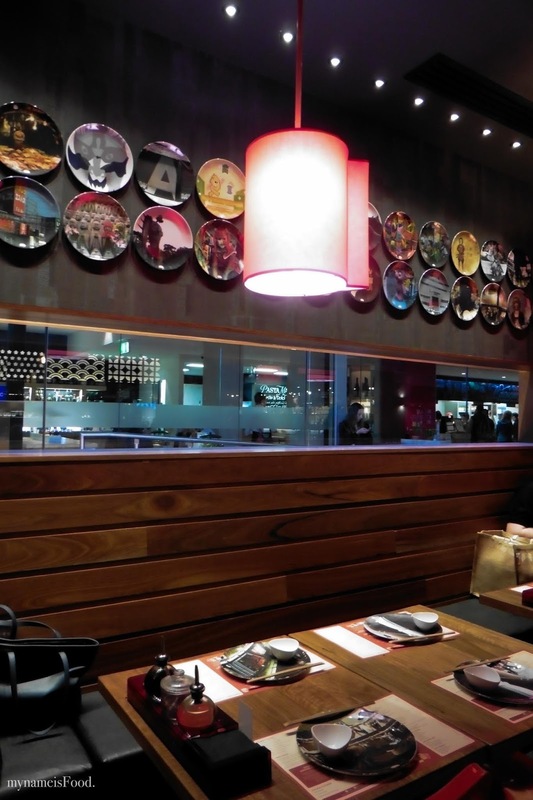 The one good thing was that, this branch actually have an actual seating area. Onion Rings were hand cut in big sizes, served with miel salad and tartar dipping sauce. The tartar dipping sauce was a nice addition but felt that eating the onion rings alone had enough flavour and saltiness. The simple garden salad was topped with grated cheese and you could use the tartar dipping sauce as the salad dressing. 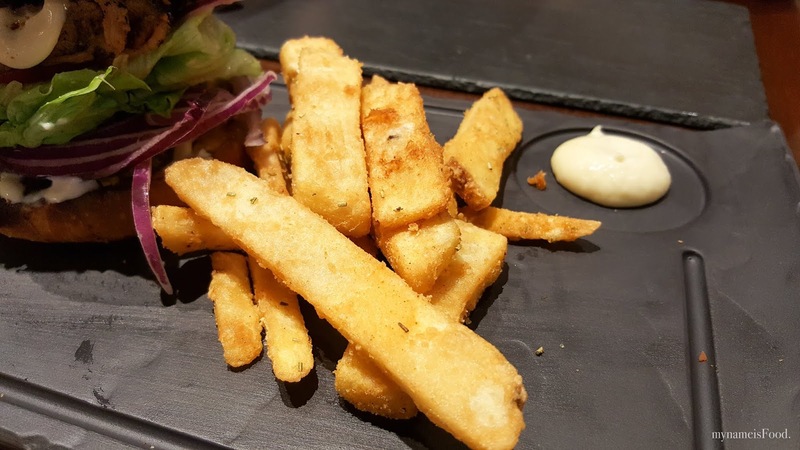 Chicken tender fries served with beer battered chips and chilli dipping sauce. 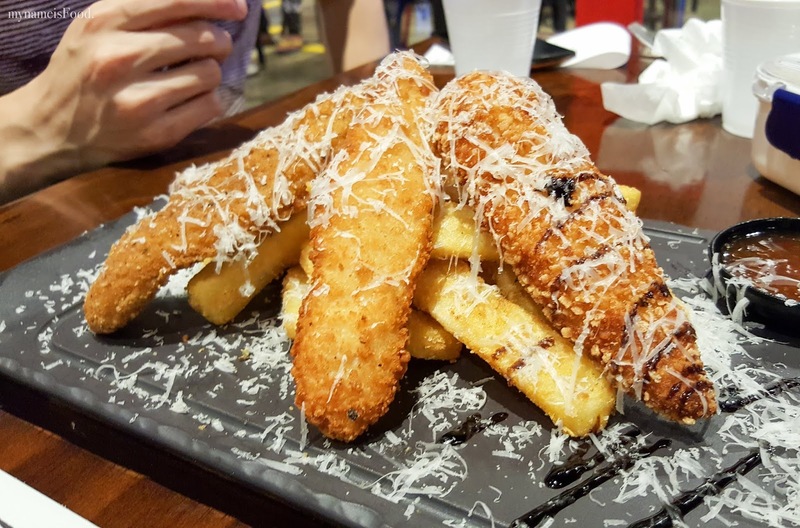 Did not get to try this but I do have to say that the portion was quite generous with big pieces of crumbed chicken. The chilli dipping sauce was more of sweet chilli. Again, this was topped with grated parmesan cheese. Korean BBQ Bulgogi Burger was a twist between korean bulgogi beef and a burger. 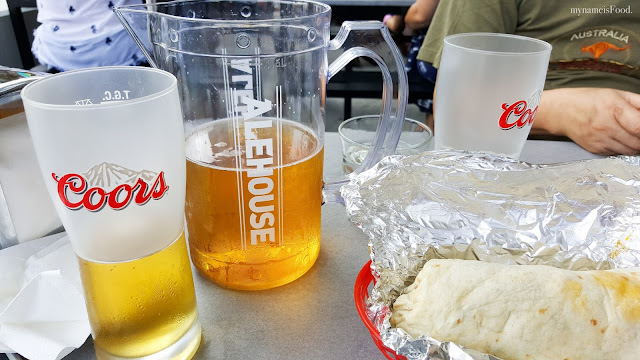 It was a good idea, but only if it wasn't soggy. We quite enjoyed it to be honest however if I had to choose from their original burger, then maybe I would go for that instead. 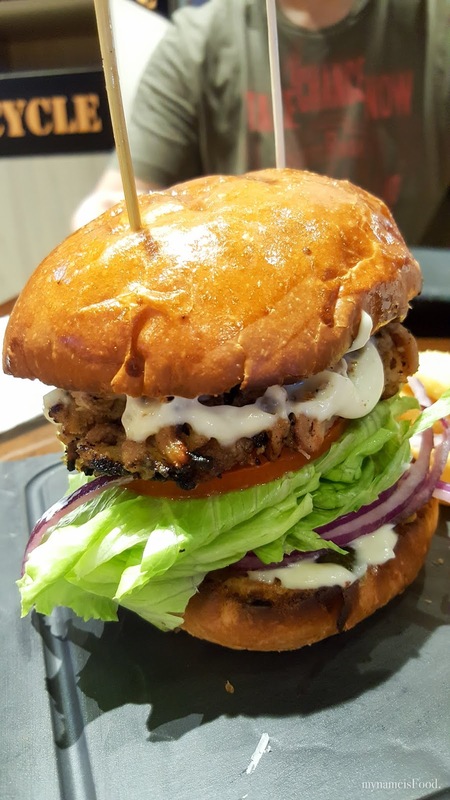 Marinated thin slices of beef with lettuce, tomato, spanish onion, tomato, tasty cheese, garlic aioli sauce all between a brioche bun. 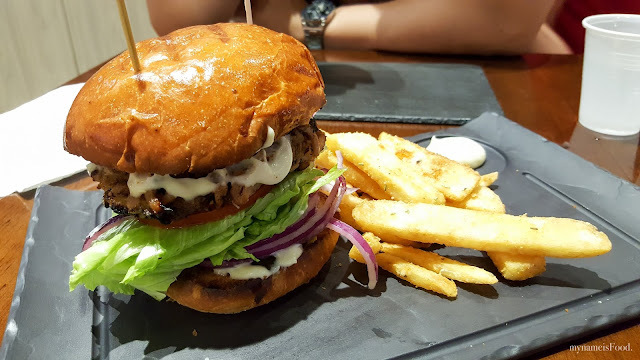 The brioche bun always have that slight charring which makes it slightly dry and tougher than its original self but added that extra smoky flavour and taste to the whole dish. The bulgogi beef was marinated well, sweet and juicy. 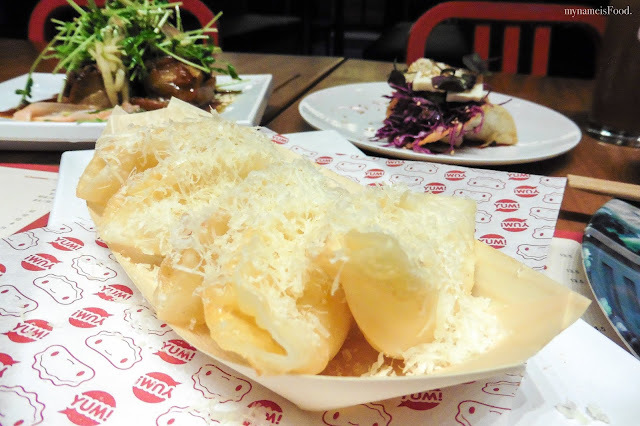 The beer battered fries here are always well cooked, crispy, hot and soft on the inside. There is a tiny dollop of mayonnaise which I found slightly useless as that's basically for one swipe for a single chip. 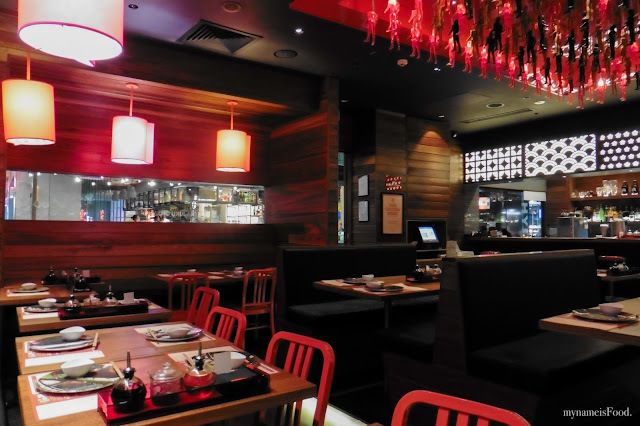 For a casual night even on a weeknight, Mien does serve up some delicious simple rice and noodle dishes as well as other meaty dishes. 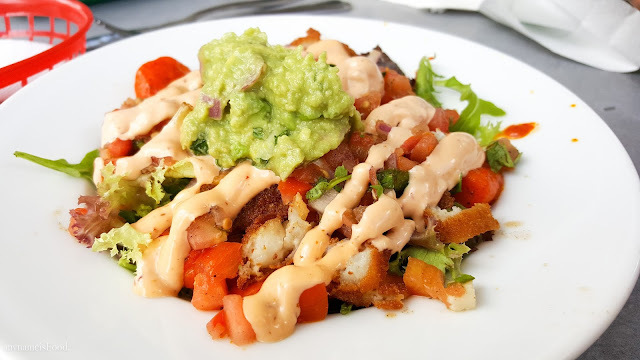 They also do daily specials so you can have a look at them but their portion is a winner as you are able to eat half the portion served and take away the rest for your next grumbling tummy moment. 'Vegetable & Egg fried rice with pork black bean sauce' (AUD$12) is simply what I'd like to call two things in one plate. 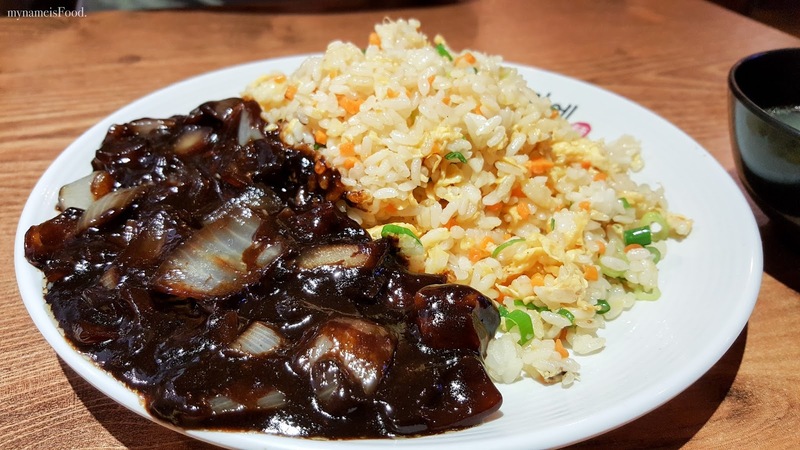 First you have your simple vegetables and egg fried rice, very simple, not too oily like the chinese version of fried rice sometimes but it is then served with black bean sauce which consists of pork belly and onion. 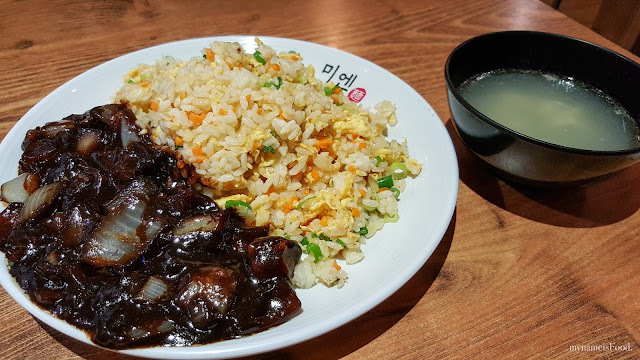 For those who aren't too sure of what it may be, it basically is a Korean version of the Chinese black bean sauce but the Koreans has developed their own version and served it in a way where it may be different than the typical chinese black bean sauce dishes. You can eat this separately but then again, you can also mix it together and make the fried rice become somewhat a black bean sauce fried rice. Yes, it may be weird at the start but it can be quite delicious too. 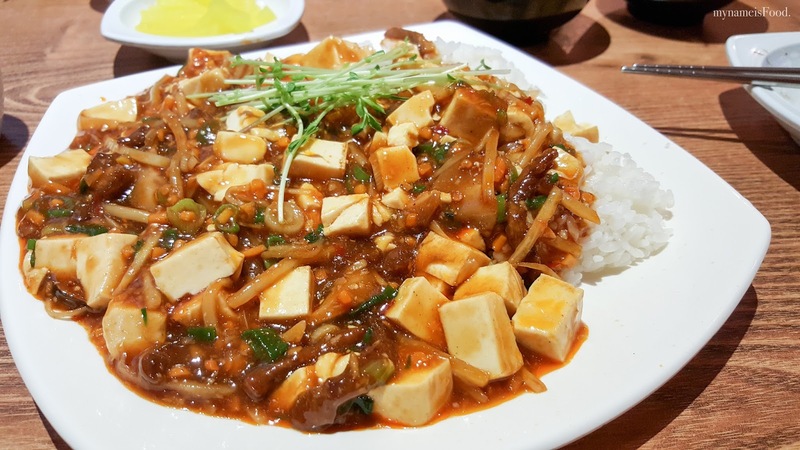 'Sichuan style spicy tofu and vegetables with rice' is basically Mapo Tofu and do I have to say that what a big portion they do give for one single portion, seriously.. If you are unable to finish it, you are able to take it away so just simply ask them for a spare container and bring it home and finish it up for supper or even tomorrow's lunch. The mapo tofu had a slight sweetness and isn't like the typical chinese version as they have added a little bit of Korean fusion but for those who don't mind to have a bit more tang but sweetness in their Mapo Tofu, they maybe you should give this a try. 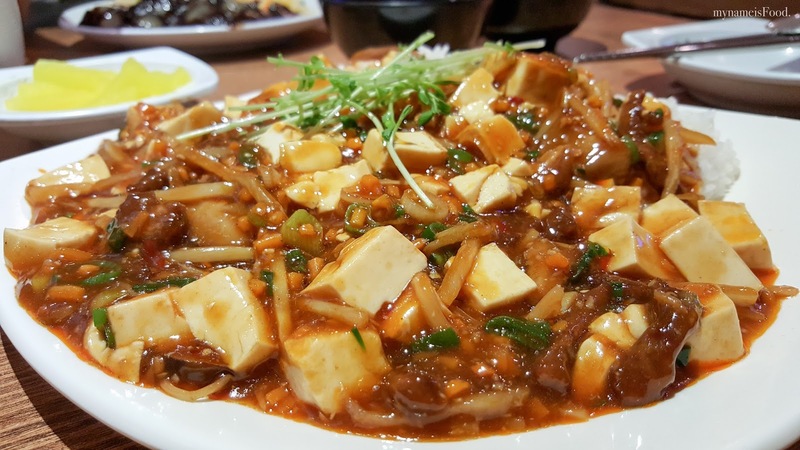 The amount of tofu and minced is also very generous. Not realising how the food would be served, we would've gone elsewhere but then, many may not care while others is fine with it while others may not fancy being served in a plastic plate and when asked for an empty plate, all you get is a plastic basket without any base or even a serviette. So sad..
'Beer Jug' (AUD$20) to share but they didn't even fill it up to the top where the indication line was, it's not that I'm just trying to point out the negatives but sometimes when filling beer up, some people may need to be aware that the indication line is there for a reason. Decided on a burrito to share with the 'Naked Bowl' (AUD$12) which is a burrito without the flour tortilla and for the burrito, we ordered the 'Carnitas (Pork)' (AUD$10.50) which was served very messy-ly which may be one of the messiest I've been served when I do eat at Burrito Bar. When you open it, the half sliced wasn't sliced properly allowing the fillings to simply fall out of either ends. 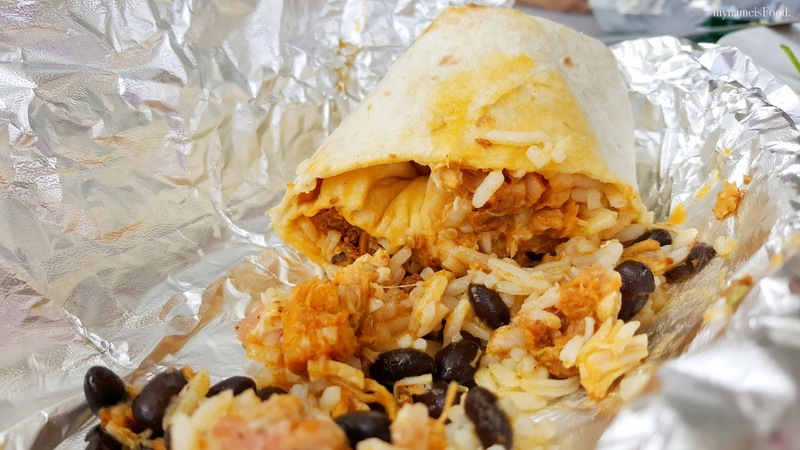 Also, the way that they had folded it made it seem to have 3/4 lime rice and the rest filled with some black beans, some strips of thin pork meat and just the flour tortilla itself. It didn't feel like I was eating an actual burrito but just alot of carbs.